The group, 888.com, can guarantee gamblers a high level of entertainment. 888 Casino, 888 Poker, 888 Sport, and 888 Games; everyone’s favorite is represented. The group is one of the casinos that has been around the longest, and is listed on the London stock exchange. 888.com uses its own proprietary gaming software, which gives it independence from other software developers. However, to achieve greater variety, 888.com does offer games by other companies. Players will discover special offers and promotions in each of the group’s four sectors. These are highly variable and provide players with attractive entry opportunities. All in all, 888.com is highly recommended and belongs to the best providers. Live play at 888 Casino is very appealing and players find the site easy to navigate. This is largely due to the fact that 888 Casino only has a relatively small selection of live games: Baccarat, Blackjack, and Roulette. The ambiance of the casino exudes pure professionalism. The Live Poker network is one of the largest and players can expect tournament action around the clock. Players can enjoy at 888 Poker free roll tournaments and high stakes poker events with the same ease. Lastly, all players can expect a bonus of 88 € free to get started. Players who prefer slots can find the best funded online casino jackpots at 888 Casino. In addition to the classic slots and a wide variety of video slots, the casino also offers 3D Roulette and European Roulette. Slot games include Millioniare Genie with a millionaire’s jackpot, Starburst, and Beat the Bank. All games have extra win features such as free games or jackpots. You will also find a series of Marvel machines in the comic strip version. Altogether, the selection of games is quite diverse, and in light of the number of high jackpots, play can be very exciting. 888 Casino offers players a 900 € Bonus Start Package that consists of various deposits. 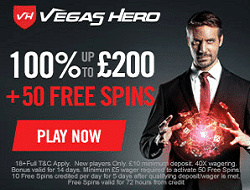 The casino also consistently provides players with opportunities for 88 € in free games. 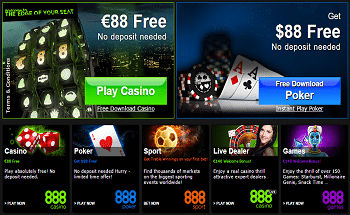 At 888 Poker and 888 Sport, players receive 88 € free without deposit. 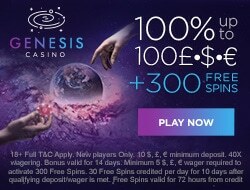 At 888 Games, players always start with a free bonus of 5 €. Additionally, tournaments for all players are announced on a regular basis. All standard payment and payout options are available to customers, including Visa and Mastercard, as well as a wide range of debit cards like Neteller, Skrill, or Paypal. 888 Casino also accepts Chinese methods of payment and this shows how broad the market of 888.com customers has become. All transactions are secure and encrypted and customer data is protected.